Saturday, August 4th at 2pm. With: David Adam Gill, Kirsten Hopkins, Vedant Gokhale, Joy Jacobs, Paul Peglar, Monica Rounds, and Sarah Teed. Free snacks and $5 wine provided. There will also be a silent auction. Take the N/W train to the Broadway stop in Astoria. University of Washington is culminating in a public reading at the Drama School. 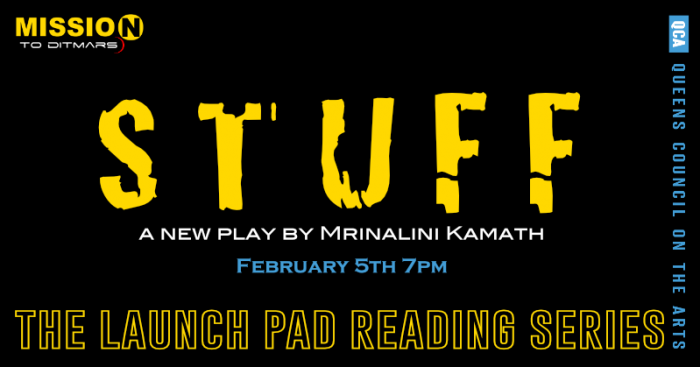 My pal and fellow Mellon fellow Nandita Shenoy‘s play precedes mine, at 6pm. This is a free reading – please RSVP. Thrilled to be asked to play in the One Minute Play Festival. I am in series B, with my play DON’T MENTION IT being directed by Andrew Willis-Woodward, and my other play NOT JUST A RIVER IN EGYPT being directed by Roger Nasser. SERIES B runs on January 26th and 27th at 8pm at the New Ohio Theatre, and tickets can be purchased here. I’m happy to be included in the Ma-Yi Theater Company Writers Lab Fall Labfest. My play, Let There Be Love, will be directed by Linsay Firman, cast to be announced. It’s a fun play with some poignant moments (if I do say so myself). I hope you can join us! My friend David Adam Gill asked me if I would be a part of this, and I was happy to oblige. It’s a site-specific collection of plays, taking place in the “Prohibition Room,” of a bar called Papillon. After seeing the space, I was inspired to write a short play featuring Sir Arthur Conan Doyle and his literary nemesis. For tickets, click here, or just click the postcard image below. Hope to see you there! Here’s a link to an article about it on Broadway World. Got to share 15 pages from a new, untitled play at Volume 53 of The PlayGround Experiment. From left to right: Geri-Nikole Love, Nandita Shenoy, and Mike Lesser. 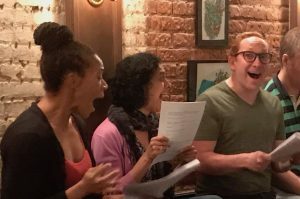 I contributed a monologue to CastAndLoose Live! Aloha Ghost In The Great Wall Of Ni’ihau. It was read by Aneesh Sheth.